The last thing Barney expects to see out of the train widow is a German airplane heading straight for them. Michael Morpurgo, the author of WAR HORSE, brings us another amazing historical fiction story that is sure to touch the hearts of many. After his house had been destroyed in a bombing, Barney and his mother try and make their way cross-country to reunite with Barney’s family, but their plans fall short when another German air raid begins. In the chaos and fear that ensues, one of the fellow passengers on the train tries to tell Barney a story in order to quell his fears and anxiety about what is to happen next. The only problem is, Barney doesn’t like /boring/ stories. He likes stories full of /action/ and /adventure/, stories just like his grandfather told him, and he /doesn’t/ think that his newfound friend can deliver one of those. Little does he know that his friend’s story is much more intriguing than any story about pirates or vikings that he has ever heard. The stranger on a train happens to be best friends with a soldier who fought in the First World War. What entails next, well, that’s quite the adventure. This book is pitched as an “alternate history” book, and I have to admit, the synopsis on the back cover doesn’t do the book justice. This is not a book exploring what would have happened if the Second World War didn’t take place, but rather, a book exploring a soldier’s life. This story explores his time in the armed forces, the many battles he had fought, his dreams, his hopes for the future of the world, and his regrets for the actions he had taken in the past. This book tells the story of world war, and the soldier who has to live through it. Of course, the “what if” element pitched in the synopsis - what if history had changed? What if the Second World War didn’t occur? - plays into the story, but it is not the story itself. The main character, Billy, deals with this dilemma, but in terms of his own actions. The “what if” itself is not a plot point, but a discussion point, and I love the way that Morpurgo incorporated this into the story. History didn’t change, but he opens up a lot of questions and discussion points himself with how he portrays this in the book. I read this in Grace’s review on Goodreads, but I also hold the same sentiment. One of the reasons I liked this book so much is because it feels like someone is /telling/ you the story rather than you /reading/ it. The way Morpurgo selects his language and crafts his sentences is phenomenal. The story has a flow to it that cannot be disturbed. For younger readers, or for those that enjoy having “breaks’ in their reading, the book was split into multiple parts and multiple chapters within those parts, so it won’t be hard to progress in the story even if you only have a few minutes to spare. In terms of character development, my favorite character in the entire book was Billy. Since AN EAGLE IN THE SNOW recounts Billy’s life, it makes sense that I would be attached to him since when I first learned of him. To put this in Barney’s words, it wasn’t just because his story was interesting and full of adventure. Billy is a truly dynamic character who will touch the hearts of all who read this story. I loved hearing the conflicts that Billy was having and the way that his thoughts and actions were described was absolutely phenomenal. As a soldier, he struggled often with “survivor's guilt” and Post-Traumatic Stress Disorder (PTSD). The way that Billy deals with what is happening in his own life, how he processes what he sees in the war, and how he acts because of it speaks volumes of his character. As a reader, we learn a lot about him through his story despite not taking the journey /with/ him, only hearing about it through stories of the past. In terms of content, the book itself covers heavy subjects. The ideas of World Wars and the consequences they cause can be a difficult subject to talk about with younger readers, but Morpurgo broaches this subject with care. In addition, his story involves the after effects of combat, the aftereffects of living and growing /up/ in a time period dominated by war. He manages to capture the atmosphere of the world during both world wars, and sheds an important light on a soldier’s plight, struggles and attitudes during both of these time periods. I think this book holds tremendous educational value as well. It does tell a fictional tale, but is based and rooted in history. The life of Henry Tandey (famously known as “The Soldier Who Didn’t Shoot Adolf Hilter”) was inspiration for Billy Byron’s story, as described in the forward and in the back of the book. Not a /lot/ is known of Henry Tandey’s life, and Morpurgo crafts what /could/ be his story. 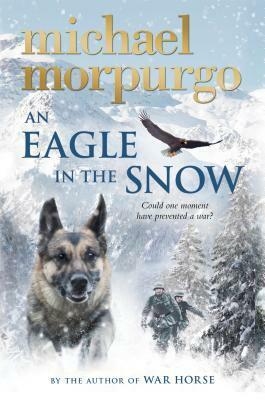 Personally, I like how Henry Tandey’s life was explained, it shows that Morpurgo did his research and also explains the roots of AN EAGLE IN THE SNOW as well. I didn’t know anything about Henry Tandey before reading this book, and now I’m excited to learn as much as I can about him! Overall, I really enjoyed this read. I would recommend this book to any reader who loves history, especially those who have an interest in World War Two and learning about historical figures. Younger readers and older readers alike will enjoy this captivating read, and they won’t be able to put this book down!